The percentage of oxygen content in the blood (arterial oxygen saturation) can be measured without bloodshed though more in exactly with a pulse oximeter. The results gathered by a pulse oximeter are insufficient for a diagnosis, determination of progress of the disease or the indication of a long term oxygen therapy. They exclusively serve the purpose of monitoring the patient [monitoring] e.g. during physical exercise training, in a sleep laboratory or in an intensive care unit. The principle is relatively complicated. It is based on measuring the light absorption or the transmitted light on the skin. 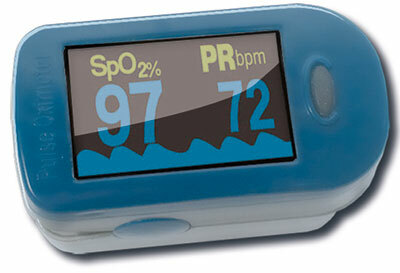 Therefore, the pulse oximeter is equipped with a light source on one side and a sensor on the other. The pulsating flowing blood is examined but the tissue and the vessels are not. The oxygen-saturated blood cells have different colour shades. Thus, the irradiating red light's photo sensor receives different absorptions. The display then shows the percentage of red blood cells saturated with oxygen. Besides the saturation, the heart rate is indicated. In the following table you will find criteria for the measuring process of oxygen saturation using a pulse oximeter. Are the fingers warm enough? If the fingers are too cold (not enough blood flow), the resulting values will be lower than they actually are. With existing diabetes and blood flow disorder, the results can be distorted. If necessary consult with your physician. Has nail polish been removed? Not all machines are able to measure through nail polish. If possible, measure using the left hand. When should the results be read? Start the pulse oximeter and wait approx. 1 minute until reading the results: one needs to estimate how the oxygen saturation levels out. Firstly, the machine needs a certain time to measure. And secondly, saturation of ten drops at the onset of exercise. Such a drop should not be considered grounds for terminating the training. The exercise should only be reduced or terminated if the results are still below the values listed in the following section. Criteria regarding reduction or termination of exertion. - Saturation < 90: Reducing exertion or longer breaks. - Saturation < 88: Terminating exertion! Saturation before the onset of (another) exertion ? 90 (95 would be ideal). Breaks need to be as long as this value is exceeded. If there is no increase in saturation within 2-3 minutes: reduce the next exercise or terminate the training. Copyright © 2014 Dr. Oliver Göhl.